It’s difficult — perhaps impossible — to say anything critical about the glut of comic-book movies without sounding like a cultural elitist and, even worse, a scold. Still, I can’t proceed with what’s going to be a positive and even enthusiastic review of X-Men: Days of Future Past without expessing a little dismay about the way Hollywood continues to cannibalize the backwaters of popular culture. This move toward the mainstream turns the once-forbidden fruit of comics into tentpole entertainments that can’t help but diminish the pleasure of those who shared in what once amounted to a semi-secret society based on avidity and accumulated knowledge, much of it useless. There, that’s off my chest. Now about X-Men. The latest installment is a superior helping of a big-screen Marvel comic that boasts creative special effects, a mostly involving story and some very good acting. The story, which brings together various generations of X-men, begins in a horrible dystopian, war-riddled future. Things are so bad that Patrick Stewart’s Professor X and Ian McKellen’s Magneto have united in a last-ditch attempt to stave off the destruction of humanity. To accomplish their goal, Professor X and Magneto employ the consciousness-shifting powers of Kitty Pryde (Ellen Page) to send Wolverine (Hugh Jackman) back to 1973. Wolverine’s time-travel mission: to prevent the assassination of industrialist Dr. Bolivar Trask (Peter Dinklage) and, thus, alter the course of a history that otherwise would lead to wholesale slaughter. Director Bryan Singer, who returns to X-Men after a decade-long hiatus, judiciously uses the ’70s — reminding us of everything from lava lamps, to the Vietnam War to Richard Nixon. Wisely, though, Singer doesn’t overwhelm the story with the events and curiosities of the ’70s: He uses them as punctuation to create an effective mixture of humor and gravity. Upon returning to the ’70s, Wolverine must locate younger versions of Professor X and Magneto, played respectively by James McAvoy and Michael Fassbender. It’s a bit of a stretch to think that McAvoy’s Charles Xavier could mature into someone who looks like Patrick Stewart. But there’s no faulting McAvoy’s performance as a dissolute and cynical young man who has yet to find his inner nobility. Fassbender, who like McAvoy has played this role before, is entirely convincing as the young Magneto, summoning the out-sized polarities of a personality that seems at ease with both its humane and malevolent impulses. The key to the plot’s resolution can be found in the character of Raven, a.k.a. Mystique (Jennifer Lawrence), the shape-shifting mutant who can avert total doom and who also looks sleek in her form-fitting blue outfit. The themes of this installment mimic those of previous movies. Society’s mutants — those who represent upward steps on the evolutionary ladder — are scorned by those who either are threatened by their presence or want to harness mutant powers as a means of advancing personal agendas. 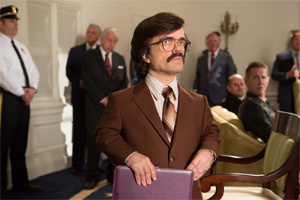 As one who has the latter ambition, Dinklage’s Trask comes as close as we get to an identifiable villain. Trask has invented destructive creatures called Sentinels, which seem to threaten both humanity and mutants. Not much, really. Singer — in his first X-Men movie since 2003’s X-Men 2 — cooks up some fine special effects, among the most impressive, the elevation of an entire stadium that hovers perilously above the White House. Not all of the X-Men are given equal time in this edition, but if Days of Future Past — a title that sounds a bit too much like a grammar lesson — stands as an exemplary addition to the never ending cycle of comic-book movies. If we have to have them, they should at least be this much fun.